Herbology Professor at HiH for 5 years. Always a Slytherin. In retirement and raising a family. Professor Lily K. Tudor is keen Herbologist, half-blood, and Oblate of St Benedict. Her father, Salvator Tudor, is a wizard, descended from an illegitimate child of Edmund Tudor. (This occurred before Edmund married a woman of royal blood). Salvator Tudor is an Auror, with a particular aptitude for healing and the healing arts. His encouragement inspired his daughter to get into the field of Herbology. Professor Tudor's mother, Rosemary Ruth Tudor, works in the field of home decorating. Rosemary always taught her daughter the importance of getting to know and appreciate the uniqueness of every individual, in order to serve them best in their lives. Ever since childhood, Tudor has enjoyed collecting chocolate frog cards, eating bloodpops before supper, and feeding chickadees. Tudor prefers to spend most of her time outdoors, and spring is her favourite season. A bias may have developed when she first joined Hogwarts School of Witchcraft and Wizardry as a Slytherin student, but her favourite colour is green. 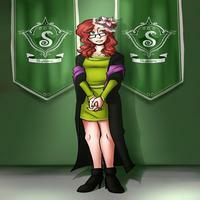 In her spare time, Tudor loves to read and write (so much so that she was almost placed in Ravenclaw). It has always been Tudor's philosophy to believe that "there are many different ways to be smart" and that each individual just needs to be open to discovering his or her talent and using it to better the world. After graduating from Hogwarts in 2000, Tudor spent three years under some of the most intelligent wizards of the day at Merlin's Universal Academy of Magic. MUA allowed Tudor the creative room to grow and develop into "one of the brightest young women the Academy has ever seen" as the Headmaster once said. To be fair, not a lot of witches chose to attend MUA. In 2003 Tudor obtained a Degree in Healing and Protective Studies. Upon graduation of MUA's intensive three year program Tudor was immediately hired to work at St. Mungos, but found herself unable to handle the emotional turmoil of a hospital environment. From there she began a research project revolving around plants and potions. Former Herbology Professor, Prof Longbottom, heard about Tudor's research and welcomed her to Hogwarts to continue the project together. Due to the time the project took up, Longbottom gave Tudor the responsibility of teaching years one through four of Herbology (with the Headmaster's permission, of course). When the project finished, Professor Longbottom received a job opportunity as a result of the studies, and Tudor was given the chance to take over the full post of teaching Herbology at Hogwarts. Here she remains to this day! Professor Tudor is happy to say that she was among the Hogwarts staff when Hogwarts first began offering classes online!